A Home Solution, Great for the Environment! 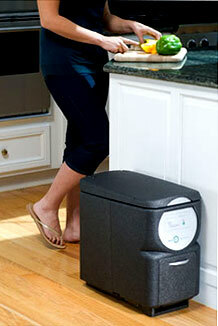 NatureMill brings composting to the home user. It is essentially a miniature in-vessel system. Waste is collected right where it is generated-in the kitchen. A computer controls the temperature, air flow, moisture, and mixing to accelerate the process and eliminate the backbreaking work. Everything is fully self contained in an modern, attractive container. Best of all, NatureMill provides home gardeners with a source of rich, organic fertilizer. And there is something uniquely satisfying about witnessing the entire food chain: from the garden, to the dining table, and back to the garden again. "This thing is amazing...it has reduced our household waste 50% and has led us to make healthier food choices.... THANK YOU FROM THE BOTTOM OF MY GARDEN!" "NatureMill has changed my life. As I get older I can't turn my compost pile (and I never really got it to work anyway). Now I have great compost on a regular basis, without the heavy lifting." "The great thing is that I didn't have to put anything together. Simply plug it in and start using it... Cuts down on house hold waste and is great for the environment." Landfills contain more food and paper waste than diapers, styrofoam, and tires - combined. Our society recycles more and more each year. But due to rising personal consumption and overall population growth, total annual landfill waste is still increasing. Recommended Materials: Add a mix of "green" and "brown" items. Limit very acidic items to 2 lbs (900g) per load: oranges, grapes, berries, plums, pickles, tomatoes. 3-4 piece limit for lemon, lime, grapefruit, pineapple. pourable liquid, chemicals, soap, cosmetics, medicine, plastic, metal, glass, rubber, alcohol, cigarettes, office paper, newspaper, magazines, hard or fibrous itmes such as chicken and steak bones, lobster and clam shells, wine corks, avocado pits, corn cobs & husks, coconut shells, lemongrass, diseased foods, human waste, disposable diapers. Power usage - 5 kwh/month - as much as a typical night light. This costs about $0.50 per month, depending on local rates! All NatureMill composters can compost pet waste, kitty litter, and cage beddings. 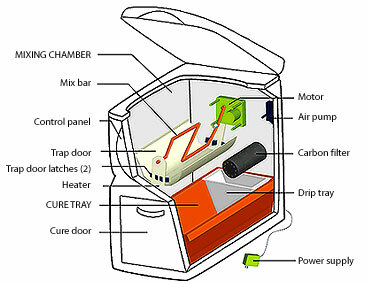 Items remain in the upper chamber, with "hot composting" conditions: mixing, air flow, heat, and moisture (see diagram). The energy released destroys odors, pathogens, and seed germination. The compost is later transferred through a trap door to the lower cure tray chamber, where it continues to compost while you add fresh waste items to the upper chamber. Add waste items - any time, any day! Add organic waste: vegetables, coffee grounds - even dairy, meat or fish! The upper chamber mixes, heats, and aerates. Compost later transfers to the lower chamber, so you can add fresh items. Empty every 2 weeks, when the red light comes on. 120 lbs (55 kg) organic waste per month. Add items any time, any day. Ideal for a family of 5, or a single individual living alone. Waste materials Almost all food waste items. The lid of the machine contains a reference sheet with specific examples. One batch every 2 weeks, depending on actual usage. An indicator light signals when to remove compost. Finished product High nitrogen compost - a soil amendment for lawns, gardens, trees, or potted plants. Compost is ready to use. Used properly, will last many, many years. No installation is required. Plug into a standard power outlet. For outdoor use, keep power supply dry and do not freeze. For installation inside a cabinet, we recommend our cabinet kit - some assembly required. Reduce trash enough to qualify for a discounted trash collection rate. Contact your trash company for details. Less watering due to high moisture retention of compost. 5 watts - as much as a typical night light. This costs about $0.50 per month, depending on local rates. Uses far less energy than hauling the same amount of waste in a diesel garbage truck. Available with a North American (110V/120V) or European (220V/240V) power supply. UL and CE compliant. Wipe the hopper and exterior with a moist towel. Rinse the cure tray and drip tray when you empty them. Do not disturb the compost cultures in the reactor chamber. Do not use soaps or chemicals. Replace air filter every 5 years or as needed. We aim to make a difference. We diligently recycle paper, bottles, and cans. We read newspapers online to cut down on paper. We favor environmentally friendly products and packaging. Some of us even walk or bike to work. But despite our commitment to “the 3Rs” - reduce, reuse, recycle - we still produce shameful amounts of trash. So we ventured into backyard composting. A humble kitchen crock diverts an impressive amount of trash from the kitchen to an outdoor compost pile. And unlike other forms of recycling, composting uses no chemicals, fossil fuels, or other environmentally harmful materials. But a few months into our compost adventure, reality set in. It smells! It's dirty! Turning the pile each month is backbreaking! It's definitely no fun in the cold and rainy months. And besides, not everyone has a backyard. We should be able to engineer a better solution. Then a funny thing happened. Someone (we won't name names) went away on vacation without emptying the kitchen compost crock. A nasty surprise awaited his return - the smell, the flies, and a very unpleasant clean-up job. While grudgingly cleaning out the compost crock, he noticed it was warm. Compost cultures were hard at work. The compost process had begun! Just a little more oxygen, some mechanical mixing, and a strong air filter would accelerate the process and eliminate the odors and bugs. Dozens of prototypes and patents later, NatureMill was born. We're up to great things. Just watch us. Someday everyone in the world will compost, and what a difference that will make. For a one year period (three year for PRO model) after purchase: free replacement parts, repair by field technicial, or replacement of entire unit. Return an unused unit within 30 days for a full refund. Due to the biological implications of composting, returns generally not accepted after contact with food waste..